Neil Gaiman (Sandman, Coraline, American Gods) brings shock rocker Alice Cooper's concept album to life in a surreal sideshow of the soul! Join a young boy named Steven on a surreal journey of the soul, as an enigmatic and potentially dangerous Showman seduces him into joining his carnival. Celebrate the 20th Anniversary of this seminal Gaiman work, returned to print for the first time in over a decade. Fully remastered in color, this Deluxe Edition incorporates complete scripts to all three chapters, black-and-white thumbnail art of pre-colored pages, an original outline of the project by Neil Gaiman, and a collection of letters between shock rocker Alice Cooper and the author! 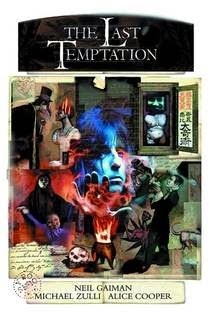 "I'm really happy that The Last Temptation is coming out for a new generation of readers, who have not seen Michael Zulli's glorious drawings, or know of the Showman and his wicked ways," says Neil Gaiman. "I wrote this a long time ago, driven by love of Ray Bradbury's dark carnivals and of Alice Cooper's own pandemonium shadow show. It's time for it to shuffle out onto a leaf-covered street and meet the people who don't know about Stephen and Mercy and show what's coming to town." I like Neil Gaiman's writing so was keen on this... I love Alice Cooper. I've not seen him live in concert, but remember the videos and performances on tv with the makeup and outfits on that he has in the comic. The comic Alice is so creepy and awesome as a showman, as awesome as live I'd imagine. I liked the spooky story, though I wish the ending was a little scarier. Still things were left open for more scares to come. This anniversary edition is perfect for the upcoming holiday season. It's sure to be a crowd pleaser, Alice Cooper fan or not. This book has vividly wicked illustrations and a cool but spooky story. Everything you could need in a scary little number. I especially appreciate the extra stuff in the book. It is an anniversary edition so they went all out. 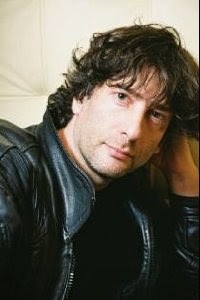 There is a cool letter from Neil Gaiman written to Alice back when this book was still a forming idea. 20 years later it was like reading a time capsule of rock-awesomeness! I feel like this was time well-spent and figure you will too! **No compensation was received for posting. Compensation will be earned from purchases made from the links within. An ecopy was received from NetGalley to facilitate a review. Opinions are owned by this site.